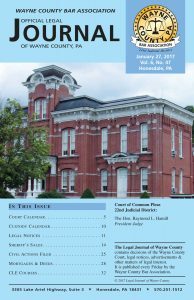 Welcome to the archive of the Wayne County Legal Journal. Here you will find downloadable issues going back to when the journal was started. To receive a free email version or print subscription copy of the legal journal go to our Legal Journal page under Public for more information.